Fast setting, extra strong adhesive. Suitable for all types of wood. Dries to a clear finish. Exterior adhesive is weatherproof and complies with EN204 type D3. 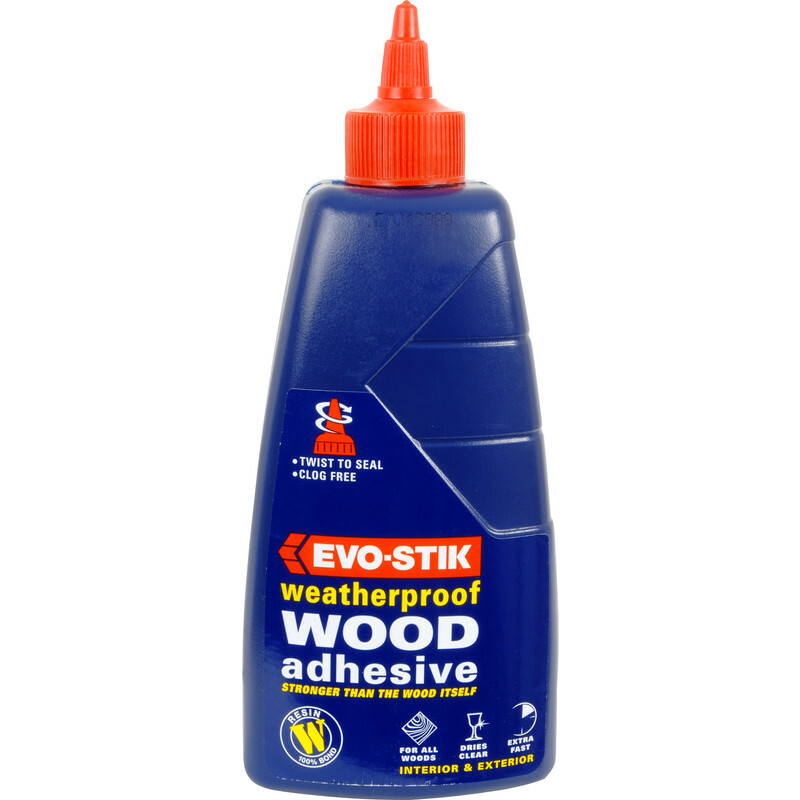 Evo-Stik Exterior Resin W Wood Adhesive 500ml is rated 4.8 out of 5 by 11. Rated 5 out of 5 by Toolbelter from Something That's Still The Same! Been using this for over 30 years and, thankfully, this stuff has not been changed. It is not gap filling, so you need good surface contact i.e. good joints but, unlike polyurethane based adhesive, this is UV stable and will last longer than the timber. It is also quick to grab so ensure your jointing is spot-on before clamping. Rated 5 out of 5 by Madada from Great price Good quality glue, best price around. Rated 5 out of 5 by Pauls diy from Great holding Bought to build a trough 6ft long 25 inches wide , all in 18mm ply so needed a solid holding glue external so had to be waterproof. Rated 4 out of 5 by Old dog new tricks from Bonds well, to all wood types. Bonds all wood types, including MDF - needs clamping while setting, and goes off rock hard in 24 hours. Ideal. Rated 5 out of 5 by Marlin from Guaranteed performance Decided to go back to using the slightly more expensive Evo -Stick product that have been using for over 25 years,as had been disappointed by cheaper alternatives. A case of "You get what you pay for"
Rated 5 out of 5 by Pedaller from Reliable and well-established I've never had any problems with Evo-Stik adhesives, and this is one of my favourites for general wood-glueing, indoors and out. A sensible size, if you don't use a lot regularly, as there's plenty of glue in the 500ml bottle, but not so much that it is wasted if not used. Rated 4 out of 5 by Rogeraee from Always use this product for contents The issue with these products is that after a short period the dispensing nozzle fails and I have to transfer to my own bottles.